Tom LaHaye, born 19-- in -- , played hockey for Michigan Tech 1954-56. need picture etc here for this local player. Red E. Lake, born 19-- in Canada?, played left wing with the 1905-06 Portage Lake Pro Hockey team. 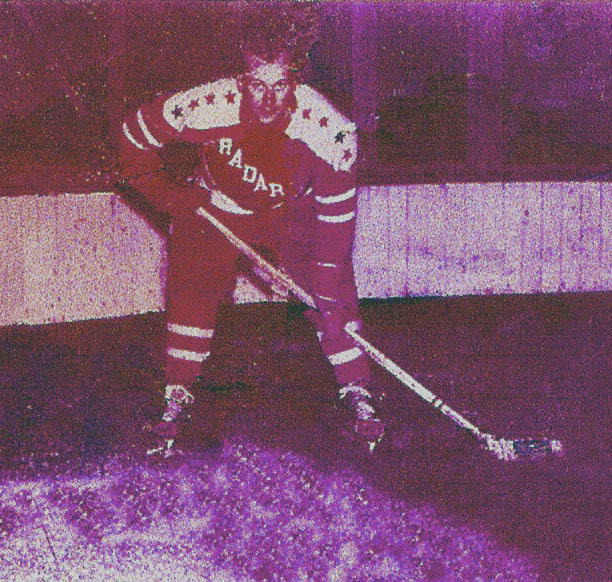 Fred lost an eye while playing in the IHL league and still went on to play 9 years of pro hockey. There are three Red Lake vintage hockey cards printed in the sets C56 (1910-11) C55 (1911-12) and C57 (1912-13). Kevin Langseth born 19-- in --, grew up playing hockey in Calumet and has gone on to be a college hockey referee, including refereeing the Frozen Four games and the world record-setting "Cold War" outdoor hockey game between Michigan State University and the University of Michigan played October 6, 2001 at the Spartan Football Stadium on the Michigan State campus. Metal pipes filled with glycol, a freezing agent, kept the ice frozen above aluminum panels, which were placed above layers of plywood between the 20 yard lines on the football field. A world record 74,554 people attended this hockey game that ended in an exciting tie. MSU Captain Adam Hall, said the crowd was so loud that players couldn't even talk to each other on the bench. Mr. Hockey, Gordie Howe, dropped the puck for the ceremonial opening face-off; Gordie was quoted as saying that there were more people at this game than there were in his hometown of Saskatoon when he left home to play in the NHL in 1946." The previous hockey attendance record was officially 55,000, set March 5, 1957 when Sweden and the Soviet Union tied 4-4 in the World Championship gold medal game at Lenin Stadium in Moscow. 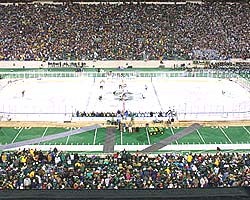 The previous record fan count for a College game was 21,576, established Dec. 29, 1984 when Michigan State defeated Michigan Tech 7-0 at the Great Lakes Invitational at Joe Louis Arena. The record crowd for a NHL game is 28,183 for a playoff game between Tampa Bay and Philadelphia at Tropicana Field on April 23, 1996. In April 2005, Kevin was one of the 3 refs of the NCAA Final Championship games. Kevin Langseth accepts an award for his 11 years in CCHA. Todd Langseth, born 1967 in Calumet, was the Captain of the Calumet High School team when they were State Runners Up in 1985 (as shown in this picture.) His Coach, Paul Lehto, wants this picture framed and called: "the agony of da-feet." Todd went on to coach in Antigo, Wisc. where he was the Antigo high school hockey coach from 1992 to 2006. In 1993 they won the Wisconsin State Championship and were runners-up in 1997. It should be noted this is no small feat, as Antigo, a town of 8,500 people, is the smallest school in their conference; they had to play against all the other schools of all sizes to win the states since Wisconsin only has one High School division. Langseth was honored as being chosen Coach of the Year in 2005. He is the athletic director for Antigo High School. 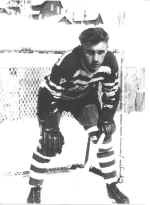 Harold Lanksbury, born 19-- in --, played with the Calumet Hawks when they won the MacNaughton Cup 2 years in a row, 1927 and 1928. He was rated by a local sports writer as the best defenseman in the league along with a Marquette player, Doug Young, who was the property of the Detroit Red Wings. Harold "Fat" Lanksbury later "played on the West Coast". need picture and more info here. Laura Lankton, born 1984 in Hancock, she attended Houghton High School and played with the local 19U Girls K-Wings (1996-2000) until she was a sophomore. 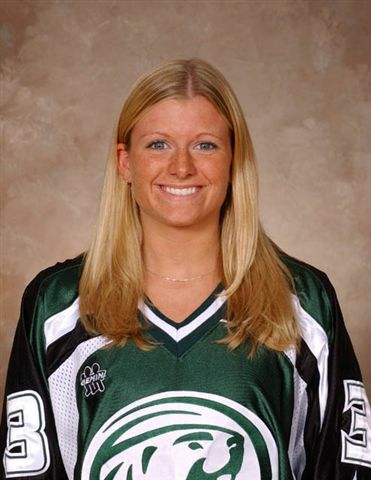 She went on to Shattuck St. Mary's, Minnesota High School to play 60 hockey games a year practicing everyday; she graduated in 2002 and lettered in hockey, cross country and track. She then played one year at the University of New Hampshire where she played in all 36 games. She now plays hockey at Bemidji State, WCHA, where she played in all 36 games in defense her first year. Gordon Lassila, born 19-- in --, a native of nearby Mohawk, played with the CLK Radars in the early and mid-50's prior to playing a season at Michigan State 1955-56. Gordie coached the Calumet High School team throughout most of the 1970's. In 1976 and 1977 he took his team to the state finals in Ann Arbor and Lansing respectively. They finished runner-up in Tier 1 to St. Claire Shores Lakeview in 1976 and got beat in the semi-final in 1977. Into Lehto, aka Sam or Carl (1914 to 1972?) born in Wolverine, MI, played hockey with the Wolverine AC in the 1930s when the Wolverine team beat Marquette in the finals to win the MacNaughton Cup in the 1933-34 season. 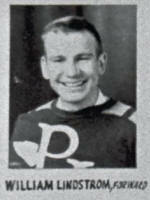 He went on to play some games with the Pittsburgh Yellow Jackets, Ind/EHL, during their 1934-35 season. This team changed leagues several times, eventually joining the NHL as the Pittsburgh Penguins in 1967. 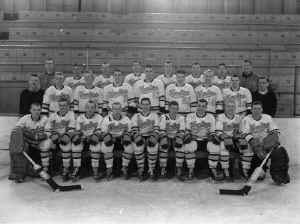 "Members of the Pittsburgh Yellow Jackets amateur hockey team, which opens its season against the Clarkson College team on the Duquesne Garden ice tomorrow night. Lehto, a fair-haired, 170 pound Finn, hails from Wolverine, Michigan ..."
Paul Lehto, born in 1938 in Wolverine? (near Calumet, Michigan) he started skating at five years of age on the Wolverine rink, located a block from his home. As a fourteen year old, he was elected president of the Wolverine rink. 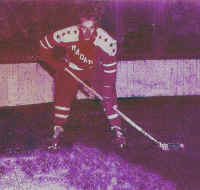 He played junior hockey in the Calumet Hockey Association from 1954 to 1957. He also started coaching junior hockey teams in 1954 while only sixteen years old, and continued to do so for six more years. In 1957, Paul headed a group who moved the rink in Wolverine to a new location, closer to US 41, and built a new changing house at the site. Paul was elected as president of the Calumet Hockey Association on two different occasions, 1962-1963 and 1968-1969. In 1968-69 he spearheaded a community effort to put artificial ice in the Calumet Armory. During this same period, 1965-1969, he also served four terms as a director for the Michigan Amateur Hockey Association. 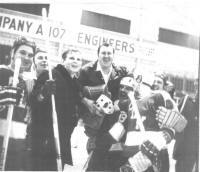 In 1964, Paul became involved with intermediate and senior hockey and coached the Wolverine and CLK Wolverine teams from 1964-1972 and again from 1979-1982. In that time, his teams won four Gibson Cups and seven league championships. In 1971, Paul and the Wolverines hosted the US National Intermediate Tournament at the Calumet Armory. During his affiliation with the Wolverines, he also served as president of the Badger State and Michigan-Wisconsin hockey leagues. In 1971-1975, Paul headed up a group of people who received a franchise in the United States Hockey League. This semi-pro league was made up of former college and professional players. Paul served on the Board of Directors and was the General Manager and occasionally, helped with the coaching. 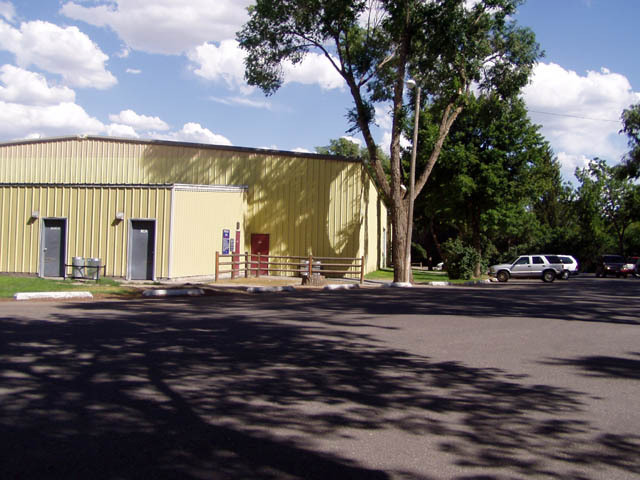 In the 1976-78 era, he was a major cog in the building of the Bi-Centennial Arena in Laurium and the installation of an artificial ice plant. Beginning in 1985, Paul began a seventeen year association with Jim Crawford as an assistant coach with the Calumet Copper King's High School team. 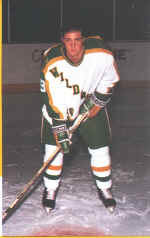 Crawford had been a former player for Paul with both the Copper Country Chiefs and the CLK Wolverines. During their stint at the helm, the Copper Kings were 331-124-10 for a .723 winning percentage. This included four state championships and two state runner-ups, nine league titles, eight MacInnes Holiday Tournament championships, thirteen Copper Island Classic championships and nine regional titles. Many of their players went on to play Junior A, senior, college and also pro hockey after leaving high school. Over the years, Paul coached teams which included such future pros as: Mike Usitalo, AHL, CHL, IHL; George Lyle, NHL; Gordie Frantti, IHL, ECHL; Jasen Rintala, CHL, ECHL; Bob Rangus, ECHL; and Fred Barry, USHL. In 2002, he retired from coaching hockey. As Calumet Township Supervisor since 19--, Paul has spearheaded numerous improvement projects for the Calumet Armory arena, such as new locker rooms, new lights, the purchase of three Zamboni's, new glass, new sound system, indoor painting and a new roof. Altogether these items totaled more than a million dollars in improvements. Wayne K. Lehto, (1933-2008) born in nearby Kearsarge, he was a member of the Copper Country 1950-51 Jr Championship team and the CLK Radars 1952-53 UP Championship team. 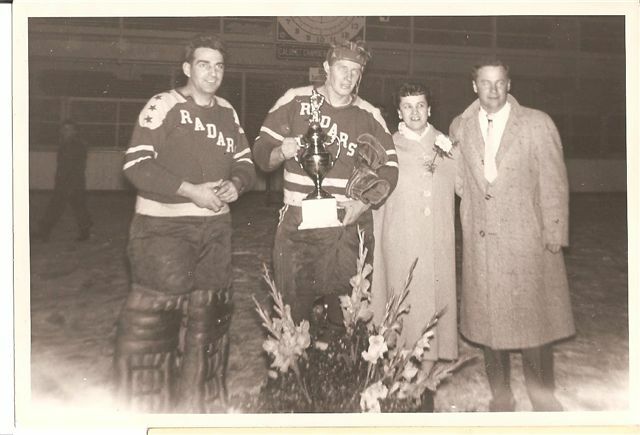 He played for the CLK Radars from 1951 through 1960 with the exception of two years in the US Army: while in Korea he played on a team (with the late Bob Johnson) where they won the Armed Forces Far East Championship. After receiving his Doctorate in Nuclear Engineering from the University of Michigan in 1967, he moved to Idaho Falls, ID to work at the Nuclear Reactor Test Station, Idaho National Laboratory, and helped form the local youth hockey program that year. He was involved with youth hockey in Idaho for over 40 years: He was an active coach 30 years, Idaho Falls Youth Hockey President 15 years, Idaho Amateur Hockey Association (IAHA) President 12 years, he was IAHA Coaching Program Director 8 years, IAHA Chief Referee for 6 years, Idaho USA Hockey Associate Registrar for 15 years. 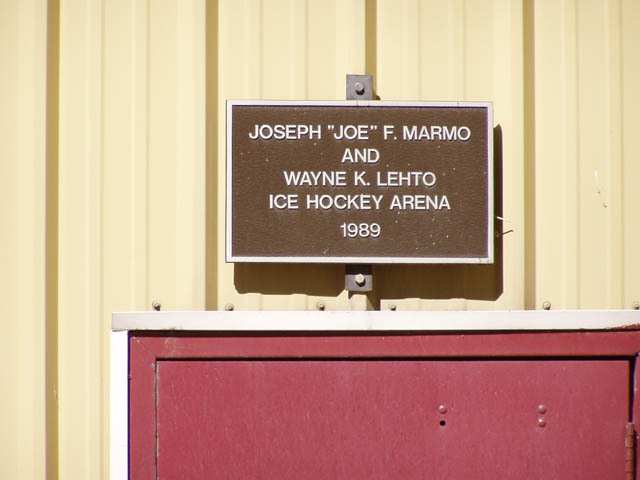 In 2005, he was elected as a USA Hockey Director from the Rocky Mountain District, as USA Hockey District Director, he served on the Legal and Youth Councils.. Lehto was instrumental in building the Ice Arena in Idaho Falls which is now named the Joe Marmo/Wayne Lehto Ice Arena, see the arena picture at right. Roger Lewis, born 1972 in Hancock, played 4 seasons of hockey with Houghton High School where he was chosen team's MVP and was selected for All-State. He played on Team Michigan for the Chicago Showcase. 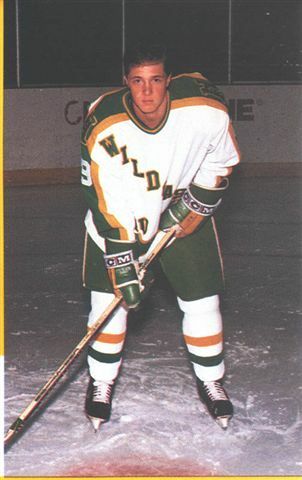 After graduating in 1990, he played one year of Juniors for Northland Voyageurs in Duluth, MN, then 3 seasons with Northern Michigan University 1994-97, then 1 year in the UHL for Saginaw Lumber Kings, then six seasons 1997-2003 in the CHL and WPHL with Memphis, Austin, Amarillo, Lubbock, ElPaso and Corpus Christi. Joseph C. Linder, (1886-1948) born in Hancock, played on the 1903-04 Portage Lake Pro team. 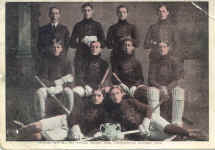 "During his Hancock High School years, 1901-04, Linder participated in and starred in hockey, baseball and football, even captaining all three sports every year of his career." In 1904, as a high school senior, he was selected by Doc Gibson to play on the Portage Lake pro hockey team. In 1906, according to Hancock High School's The Ingot, Joe received a slash on the head which cut in to the bone from Mahan in a game with the Portage Lake Juniors. "It was patched up and he continued the game. A few days later it began to bother him and upon examination it was found that blood poisoning had set in. Joe was taken to the hospital where an operation was performed and in a few days, the danger was past." He was the Coach of the Hancock High School team at the time. In 1905-1911, he played amateur hockey with the Hancock Hockey Club, then the Pittsburgh? Shamrock Hockey Club, Duluth Curling Club, and then the Duluth Hockey Club. 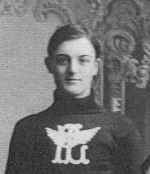 From 1912-20, he played with the Duluth Senior teams in the new American Amateur Hockey Association. He was Captain of the 1914 Duluth team when on March 7th, 1914 they defeated the famous Victoria's of Winnipeg for the first victory of an American team over the Canadian Champs. He was described by his contemporaries as the "first great American-born hockey player" quotes the US Hockey Hall of Fame. A few years before his death, he was honored in the February, 1941 issue of Esquire when, in a review of the American and Canadian hockey scene it was stated that "any list of the 30 best hockey players the whole world has had, would have to include the American-born Linder." He was inducted into the US Hockey Hall of Fame in 1975. Joe Linder top row, second from right. 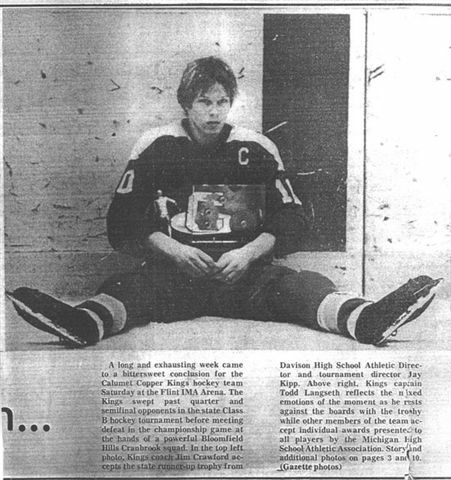 Joe Linder played 4 years of Hancock High School hockey beginning in the 8th grade. Therefore, when Joe was a Senior at Hancock HS, he was not eligible to play on the team because he had played 4 years already, so he was appointed Coach of the 1906 High School team. Carl Lindstrom, born 1919 in Wolverine/Kearsarge and moved to Painesdale when he was 2; he played on the Painesdale and Portage Lake hockey teams until March 6th, 1941 when he left the Copper Country for the Military. While there, he was a Player/Coach for the US Army team in Medford, Oregon and served in the Army until 1946. The seasons of 1948-50, he was a player on the senior hockey team for Mack Park, Detroit. He was a Coach 1960-61 for St. Monica Bantams, in Detroit, and 1961-64 coached the Elson Post Midgets, Detroit when they were State Finalists in 1961-62 and National Champions 1963-64. 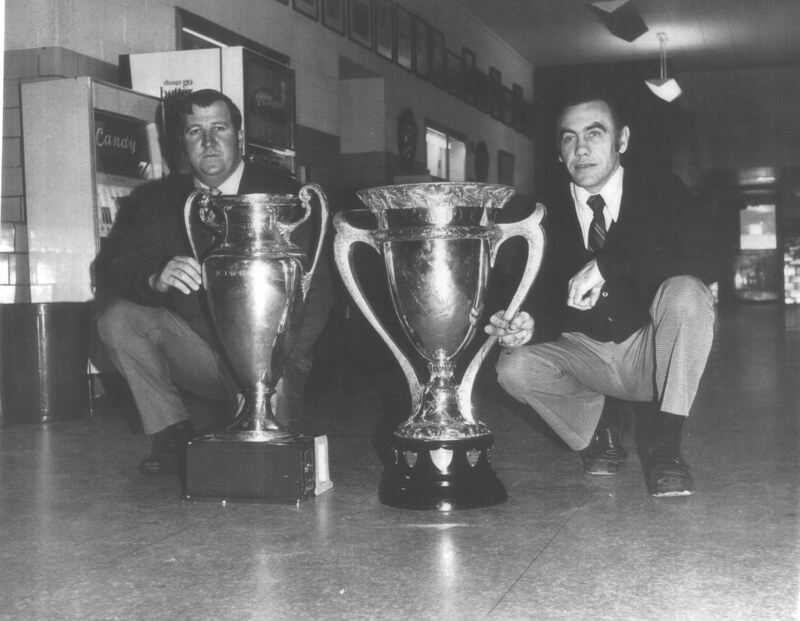 In 1964-65 he coached the Redwing Forum Midgets in Detroit, and from 1965-69 he coached the Big "D" Dearborn Fabrication Midgets in Detroit when they were State Champions 4 times and National Champions 1965-66 and 1968-69. In 1969-70 he coached the US National Junior Champions, Olympia Agency Insurance team, in the Michigan Junior Hockey League which included Gordie Howe's boys Mark and Marty. In 1970-72 he coached the Detroit Junior Wings, sponsored by the Red Wings and the first American team to play in the Ontario Hockey Association Junior "A" League. They were the SOHA Champions 1970-71; and CAHA Eastern Division Finalists 1973-74; he was General Manager Michigan Eagles, National Midget Champions. In 1975-76, he assisted in organizing Southfield Chief's Junior GLHL. In 1977-79 he was Chief Scout/Advisor of the Detroit Junior Wings. Carl was inducted into the Michigan Amateur Sports Hall of Fame in 1997. In 1979, Carl was a coach at the 1980 US Olympic Training Camp at Colorado Springs; XIII Winter Olympics Gold Medalists. April 24, 1979, Carl was inducted into the Michigan Amateur Sports Hall of Fame. William Lindstrom, born 1928 in Painesdale, played youth hockey in Painesdale and played on the 1947-48 Portage Lake team that won the Gibson Cup. He played for the Detroit Auto Club 1948-50 in the IHL. 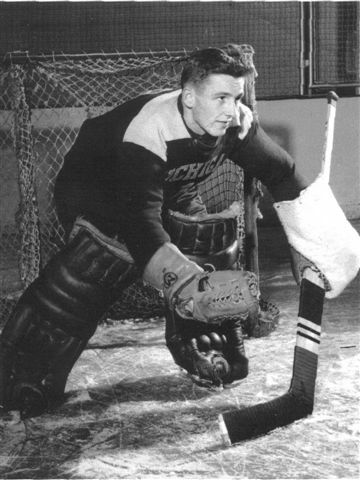 He played semi-pro hockey for the Bobcats, the first pro hockey team in Green Bay, in their first season, 1958-59. In 1969, he was instrumental in bringing High School Hockey back to the UP; where he represented the Marquette HS team management. Gary Lishinski, born 1952 in -- a Houghton native, played hockey for Michigan Tech 1971-73, played with the Calumet Chiefs the following year and with the Peoria Blades 1974-75. need pictures in uniform here! Fran Lowney, was born Jan 1, 1923 in Houghton. 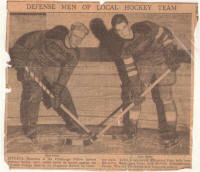 His first organized hockey team played at the Central Houghton outdoor ice rink which was between the HS and the jail. 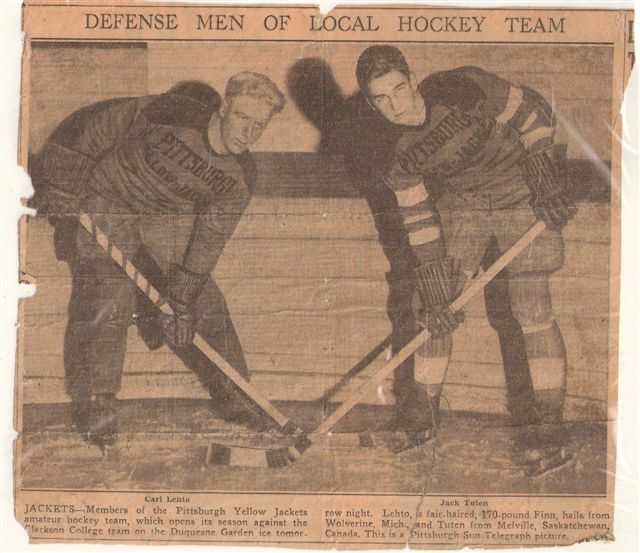 After he spent 3 years in WWII, they started Intermediate hockey league in the Calumet area. He played on the 1946-47 Hubbell Hawks, and the 1948-49 South Range Rangers, then played 7 seasons for the Portage Lake Pioneers team 1949-1956 and a few games in 1957 when PL team members had the flu. As part of the Copper Country Hockey Centennial project, Fran was interviewed by the Keweenaw National Historical Park; this tape is in their archives. William G. Lucier, born 1932, in Windsor Ontario, played high school hockey for Assumption High School in Windsor and played Junior in Ontario. He attended the University of Michigan in 1952 thru 1955. While at U of M he was a 4 year letter winner as a goaltender on the hockey team, making it to the final four all fours years. 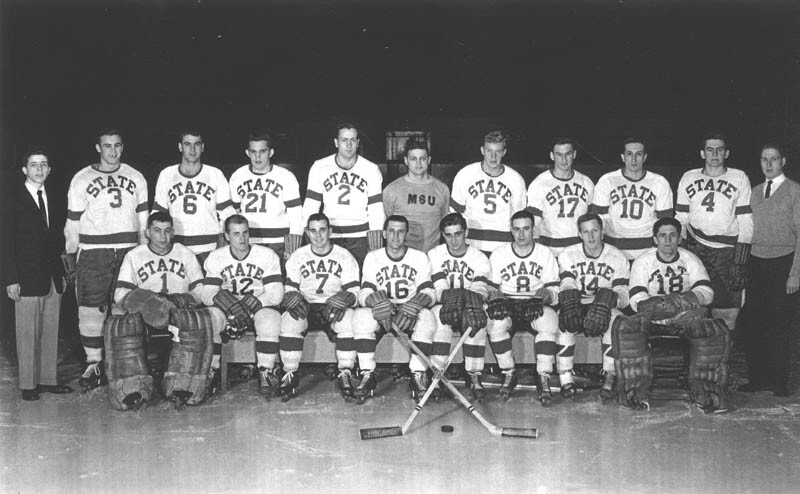 In 1952, 54, 55 his teams won the NCAA National Championships. 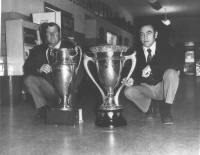 (3rd in 1953) In 1957, Lucier was hired by Michigan Tech University as the first full-time assistant hockey coach under John MacInnes; and as Head football coach. (His football teams won two conference titles in his six years as head coach; he was selected Football Coach of Year in 1963 and '65.) He was the assistant Hockey coach from 1957 to 1962. 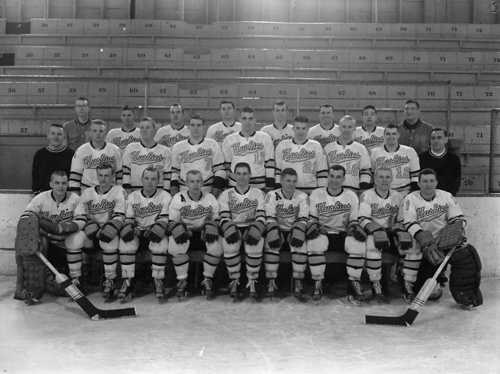 While coaching hockey at Michigan Tech, the Huskies Won 2 NCAA National Championships in 1961-62 and 64-65 seasons. He was the Assistant Coach at Michigan Tech when NHL great Tony Esposito was playing goalie. The Huskies went to the final four three times while he was an assistant coach. So Lucier participated in seven NCAA national Hockey championships - four as a player at the University of Michigan, and three as an assistant coach at Michigan Tech. These seven championships represent five first place finishes, one second and one third. Lucier still lives here and was inducted into the Michigan Tech Sports Hall of Fame in 1985.